FARMINGTON, Conn. (AP) — Connecticut hasn't become the Silicon Valley of bioscience quite yet, but five years after lawmakers made a massive investment to support the development of that industry, there is a thriving hub in Farmington. Eighteen technology or bio-medical startups recently set up shop inside new laboratories at the Cell and Genome Science Building on the University of Connecticut Health campus. The labs are being leased to the companies as part of the university's Technology Incubation Program, which is designed to help bioscience and tech companies start and grow in Connecticut. They were built using $19 million in funding from Bioscience Connecticut, the almost $900 million bonding initiative championed by Democratic Gov. Dannel P. Malloy in 2011. 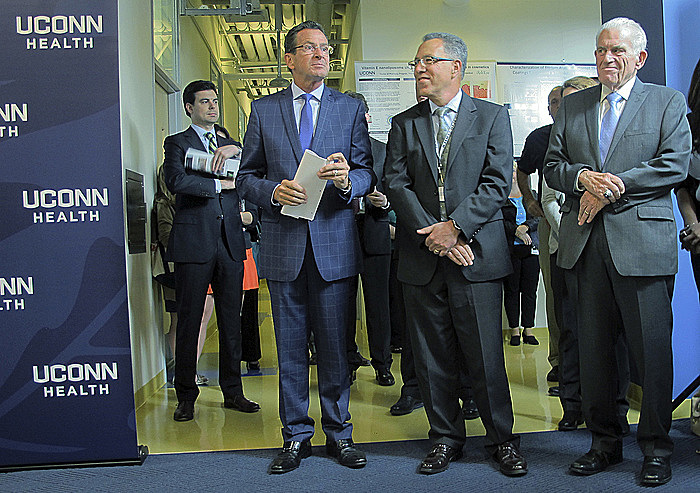 "We're making the kind of investments that quite frankly should have been made decades ago," Malloy said Thursday, during the ribbon-cutting ceremony at the laboratories. "We know that a lot of companies can be started here. Now, we're going to be concentrating on starting them here, having them grow here and keeping them here." That initiative has included major renovations to the school's hospital and the relocation of the Jackson Laboratory for Genomic Medicine to the UConn Health campus. The work being done at UConn and Jackson has helped breed the startup companies such Shoreline Biome, LLC, which is developing a product to help doctors and researchers map microbes in the bodies of their patients and test subjects. UConn's incubation program has helped Shorline Biome with everything from equipment, to accountants, to business planning experts, to student interns and venture capital contacts. But company co-founder Mark Driscoll said that most importantly, it's given his company access to a community of a bioscience researchers all located within several miles of each other, with whom he can collaborate. One of the scientists working with his company is George Weinstock, the director for microbial genomics at Jackson Lab, who led a groundbreaking study of the microbiome and its contribution to disease. "It's really created an ecosystem that has allowed us to exist," said Driscoll. The bioscience sector currently employs about 24,000 people in Connecticut, according to the governor's office. There are 30 companies in the incubation program, many of them started by UConn students or faculty based on research done at the school. Those companies have generated $45 million in revenues, school officials said. The labs in the Cell and Genome building, with 28,000 square feet of space, began leasing to companies in January. They are currently at 60 percent occupancy, according to UConn. Other companies there are working on products such as a device that tracks the progress of chronic illnesses by analyzing patients' breath and personalized diabetes medicine for patients with genetic cholesterol disorders.